Robert ‘3D’ Del Naja has a lot on his mind. Yesterday was the first day of rehearsals for Massive Attack’s forthcoming world tour and the band frontman’s pained expression suggests it did not go well. 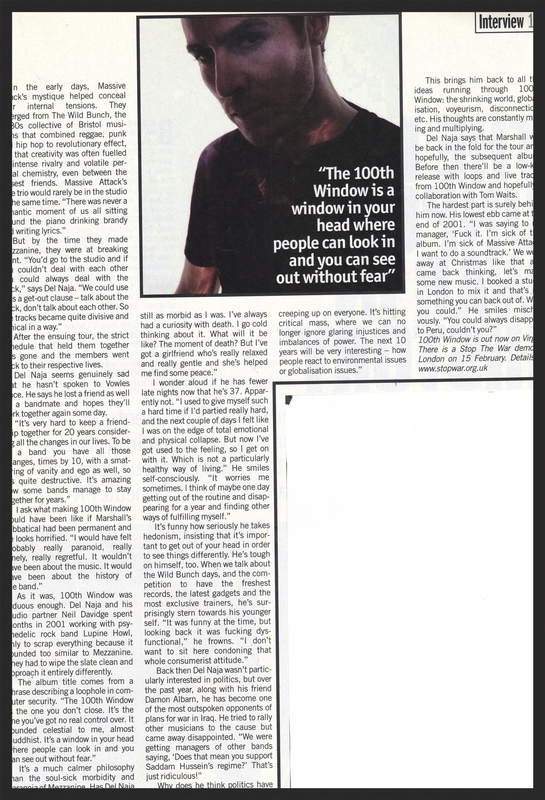 We’re sitting in the bar of a London hotel and for the first time Del Naja is promoting a Massive Attack record, 100th Window, single-handedly. Ever since their 1991 debut, Blue Lines, one of the best-loved and most influential records of the 1990s, Massive Attack were a fluid set-up. Collaborators (among them Tricky, Tracey Thorn and Shara Nelson) came and went. On their fourth album, however, even the central trio has dissolved. Andrew ‘Mushroom’ Vowles left and Grant ‘Daddy G’ Marshall is taking time out to bring up his new baby. That must be hard for Del Naja, I suggest. Previous Massive Attack albums, 1994’s Protection and 1998’s Mezzanine, divided opinion, but neither was quite as confounding as 100th Window. Where once there were several voices and styles crisscrossing, now there’s a consistent, eerily beautiful ambience populated by only three vocalists: Del Naja, old friend Horace Andy and Sinead O’Connor. Haunting and elusive, it sounds the way music does when you’re half-asleep. 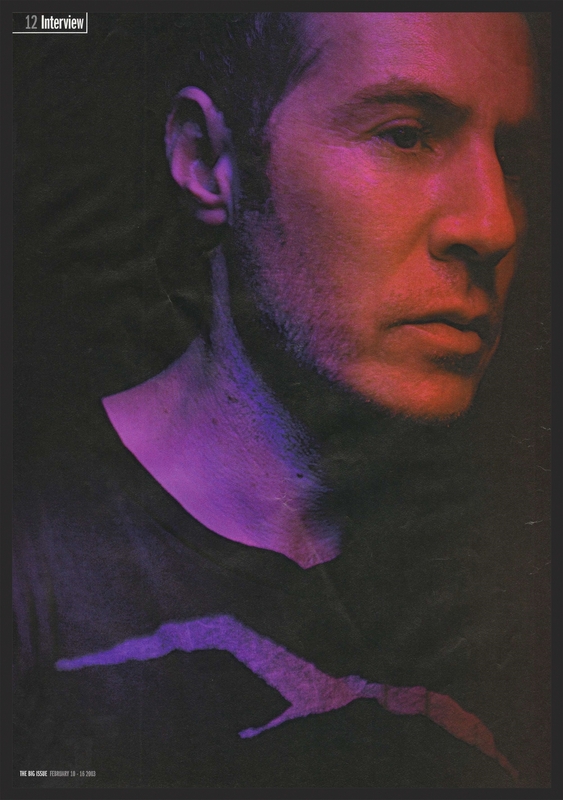 Del Naja often reads comments posted by fans on Massive Attack’s website and he’s bothered that some people are calling 100th Window his solo record. He protests that if that were the case then he’d put his face on the CD cover and posters. “You could make yourself famous overnight. Bingo. And that would be horrendous.” In fact, attention makes him wriggle. He enjoys seeing if he can walk from the door of a Massive Attack gig to the stage without being recognised. The strategy obviously worked. I expected Del Naja to be intimidat-ingly fashionable and aloof, but he’s the opposite: friendly and nervy and not quite comfortable in his skin. While he raps and sings in a dry murmur, he speaks quickly and intensely in a West Country accent. After the ensuing tour, the strict schedule that held them together was gone and the members went back to their respective lives. Del Naja seems genuinely sad that he hasn’t spoken to Vowles since. He says he lost a friend as well as a bandmate and hopes they’ll work together again some day. As it was, 100th Window was arduous enough. Del Naja and his studio partner Neil Davidge spent months in 2001 working with psychedelic rock band Lupine Howl, only to scrap everything because it sounded too similar to Mezzanine. They had to wipe the slate clean and approach it entirely differently. This brings him back to all the ideas running through 100th Window: the shrinking world, globalisation, voyeurism, disconnection, etc. His thoughts are constantly mixing and multiplying. Del Naja says that Marshall will be back in the fold for the tour and, hopefully, the subsequent album. Before then there’ll be a low-key release with loops and live tracks from 100th Window and hopefully a collaboration with Tom Waits. The hardest part is surely behind him now. His lowest ebb came at the end of 2001. “I was saying to my manager, Tuck it. I’m sick of this album. I’m sick of Massive Attack.